Charlotte NC Paving provides commercial clients a free, no commitments, on-site asphalt road inspection performed by senior experienced asphalt pavers. Their goal is to determine the most cost-effective and long-lasting repair for fractured, pock marked or any other type of damaged pavement. We apprise you of all repair options available- including their pros and cons. We then, respectively, give you time to decide your best solution while staying available for further questions. ​If you’re not 100% satisfied with our assistance, be sure to let us know! Asphalt pavement repairs require inspection before committing to a specific type of fix. Although many types of damaged asphalt pavement have their respective repairs, the pavement’s system that makes up a road is a sum of its parts and each need to be examined to understand the root cause of the failure. Does the grading of the immediate and surrounding area direct the storm water away from the road way and from slipping under the pavement? Was the road designed correctly for the type of traffic it needs to carry? Experienced asphalt pavers preforming the inspection can probably figure out what’s wrong in a short period of time. They can then describe possible solutions to the commercial client- hopefully giving them a few solutions to ponder. We always suggest the least expensive fix first and after explaining its pros and cons we move on other optional fixes that will perhaps use a different asphalt mix, hot patching or cold patching. ​Alligator Cracking is a patch of cracking that looks like alligator skin cause by a subbase failure because of water infiltration, loads that are too heavy for the pavement design, or the pavement is old and worn out by the oxidation of the asphalt glue or cement. Alligator cracking fix requires removal of cracked pavement, cleaning area of foreign debris, subbase inspection and repair, application of tack coat, fill the area with asphalt and finally, compaction of asphalt. Potholes begin with slight cracks caused by the expansion and contraction of the ground during winter (freeze and thaw cycles) or stresses put on the pavement by heavy traffic. These slight cracks in the pavement allow water penetration of the subbase structure weakening it into collapse which is then reflected up to the asphalt pavement. They can also be the result of missing chunks of alligator pavement. Pothole repair will remove the defective asphalt down to a stable base, square off the hole vertically, apply tack coat, fill with asphalt mix and finally, compaction of asphalt fill. 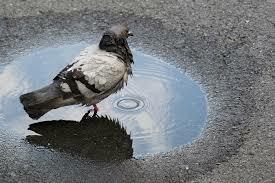 ​Basins or depressions (birdbaths) are slightly lower areas that become noticeable because of ponding water after a rainfall. Causes are traffic loads heavier then what the pavement was designed for, poor compaction of all materials during construction or water infiltration of the subbase by unchecked water runoff. Slight depression fix could just require a surface patch, but a deeper depression might require removal of affective asphalt and repair to the subbase before patching with asphalt. ​Edge Cracks run along the inside edge of a road, parking lot or driveway surface. The width is usually less than 2 feet. Common causes are poor drainage conditions, heavy vegetation along the edge and a lack of support at the pavement edge. Fix requires removal of damaged edge pavement, removal of existing vegetation along the edge, fix drainage issue, repair subbase and then reconstruct the paved edge with new asphalt. Upheaval is an upward movement in asphalt pavement because of subbase swelling due to moisture or ice under the pavement. Fix requires removal of affective asphalt and repair to the subbase before patching with asphalt. Asphalt road Resurfacing, or overlay, is a way of repairing an existing road by paving overtop of it. There are certain preparations for constructing an overlay, some of which include milling or shaving the original pavement into a more even surface to help match the existing landscaping around it. Areas that are in very poor condition must be removed and patched or those problems will reflect back up through the overlay. Sometimes all that is needed, is a thin layer of asphalt laid down to level out any slight cracks or shallow depression. After the road has been leveled by the previous methods, the road is cleaned, an adhesive tack coat laid down and then the new asphalt is applied in layers. Shaving a process that uses a series of diamond tipped saw blades mounted on a rolling shaft that shave the upper surface of a asphalt pavement to remove bumps, restore pavement noise level, and improve surface friction. The asphalt as it's being shaved is dumped in a truck which is then hauled to a asphalt recycling plant- making it Eco friendly. Milling is when part of the surface of a paved area is removed and ground up to be used as the aggregate in the new pavement. 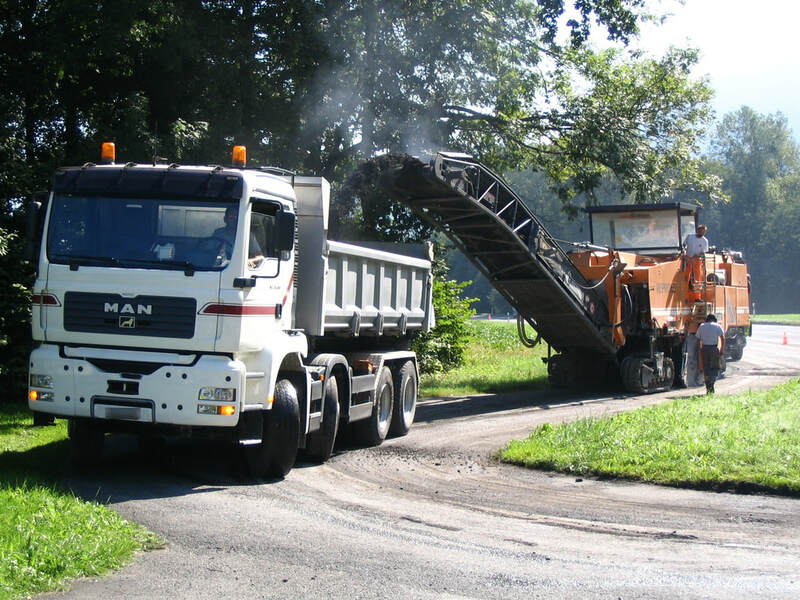 Just enough of the surface is removed to correct the uneven road surface caused by bumps, loose aggregate, rutting, and depressions. This process is responsible for recycling about 95% of asphalt pavement needing to be repaired. Overlaying is less expensive than fully reconstructing a paved surface, and normally takes less time, making it a great option for asphalt road repairs. However, the areas that now puddle will again puddle since in most cases, the grade cannot be alter by just paving an overlay. Lifespan for an overlay or resurfaced asphalt road is 8-10 years with regular maintenance. Need to build a new road or roads instead for apartments, medical clinics, schools, universities, condos, HOA communities or industrial parks, click here for more information! Contact our friends if you need a paving contractor Jacksonville NC.